What is your name and role within Tunes Of I? Yo, my name’s Conway and I sing and play guitar in Tunes of I. All of us are based in the Wellington area. We’re super privileged to have a humming, eclectic music scene here. We all play around town in a range of different groups playing jazz, funk, disco, rock, latin… all sorts! 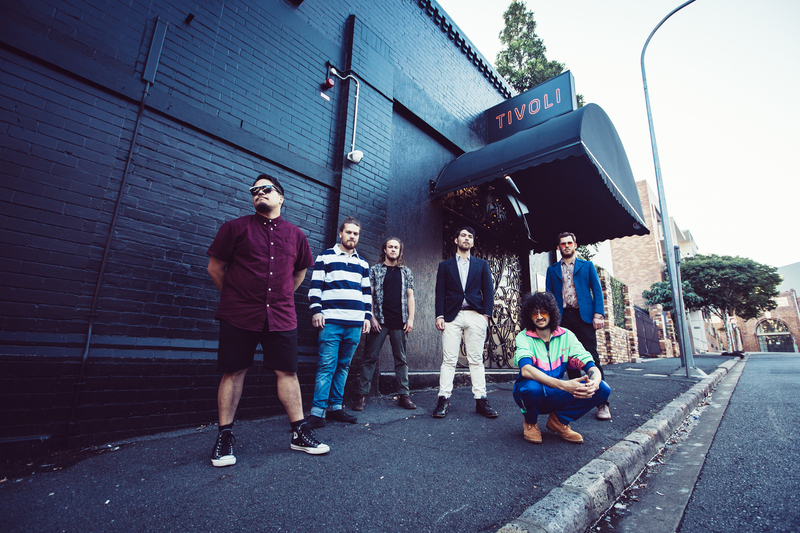 So we’re pretty spoilt for choice when it comes to a broad range of gigs and musos around town. But Tunes is our collective baby. You recently toured Australia with Ocean Alley, how did this tour come about? The tour with Oceans came about over a growing friendship through touring New Zealand with them over the last couple of years. We all get along super well and dig each others tunes. So when the boys asked us if we’d like to join them on their album release tour in Auz, we jumped at the opportunity! The tour was incredible! Australia really knows how to party and really dug our flavour which was super humbling. All of the shows had memorable moments, but I think for us the first show was that moment of bliss of having a packed out house who had never heard us before, and seeing that they were picking up what we were putting down… we were thinking to ourselves “woah, this is pretty special”. What do you find most challenging and rewarding about touring? Most challenging? Probably the long hours, running on fumes and then pulling the energy to hype a crowd, but when you’ve got a heaving crowd you find it. And the most rewarding would have to be travelling, playing music and meeting new fans with your mates. Nothing quite like it. How did Tunes Of I start as a band? We all met at jazz school in Wellington. It started as a three piece with myself, my roommate Louis on bass and mate Mudz on drums. We wrote some originals and thought we should get some saxophone in the mix, which is where Bryn came in. Then, slowly over time the band became bigger, Jules came in with his lush, ambient guitar playing, Makura replaced Louis, Kaito and Mikey joined Bryn in the horn section and Luther stepped up in Mudz’ place. So we had a 7 piece for the last few years, but just recently Mikey’s gone off to travel the world. So now a six piece. Drums, bass, two gats, sax and trombone. How did you start playing music? I started playing guitar when I was 11. I always had a guitar lying around the house but never picked it up until then and fell in love with it. I’m an only child, so for a lot of my childhood my guitar was somewhat my best mate and my company when I needed it. Ever since, I’ve wanted to be a musician. 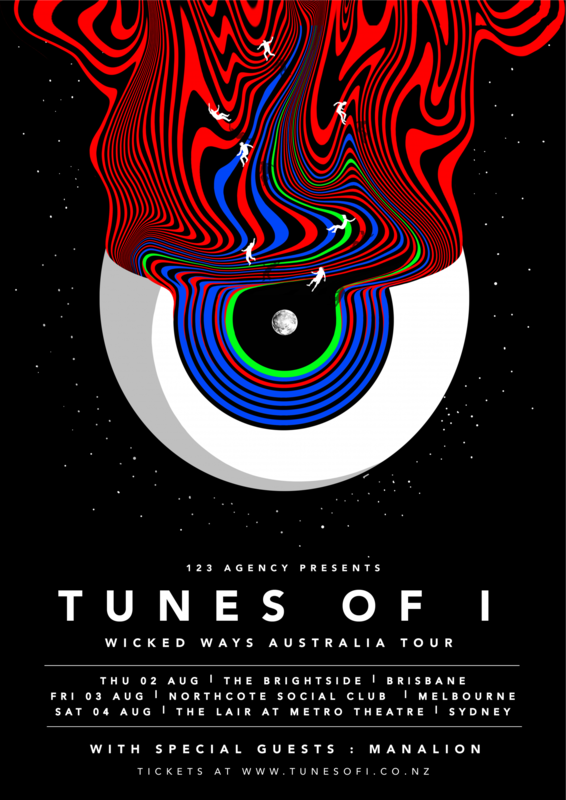 Tunes Of I has recently signed with 123 Agency, please tell us about what this mean for the band? Yeah it’s super exciting! They saw us in Sydney at the Enmore and from there we met up and now we’re coming back to Auz in August. Can’t get over how fast that’s moved, but we’re itching to get back! You’ve just announced your debut Australian headline tour! What can we expect from these shows? We’ll be giving everything that we were when we were on tour with Ocean Alley, but we’ll be cranking out a longer set this time around. Looking at crafting a set that can really hit people with that heavy Tunes sound but also some of our more playful funky songs too. We didn’t really delve too much into those songs on the last tour. We’ve also got our bros Manalion on board with us too so they’ll get the party started for sure! I find after playing with a band I’m always cranking them after as if to re-live the moments, it helps with the post-tour blues haha, so at the moment Ocean Alley’s new album is on rotation. Some other bands that I dig listening to would be Vulfpeck (they’ve got that old school funk vibe down-pat), bit of Tom Misch, Snarky Puppy, Pink Floyd… all sorts. I usually just pick something and then let Spotify do the rest. Any plans for an up coming album? Yeah, we were just in the studio last week. We’ll be releasing some fresh stuff soon and hopefully an album isn’t too far on the horizon. Where can we listen to some of your tracks? You can find our tunes on Spotify, iTunes, Bandcamp. All the usual places. What do you have planned for the rest of 2018 going into 2019? We’ve got some shows coming up at home for Winter and then onto the Auzzy tour in August. Got a few things working away in the background too. I’m mostly plant based, so anything tasty and plant based is dope! Also, I can’t go past my lady’s self saucing chocolate pudding. And my favourite place to hang? Probably having a few beers with the bros at the Rogue and Vagabond in Wellys. There’s always sick music, they have a huge selection of tasty as craft beers and you can usually guarantee that some of your homies will be chilling there… too good!